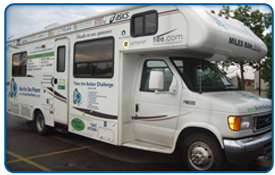 When we decided to use an RV to shelter us for the year, we knew it had to be in alignment with our tour's message of inspiring environmental action, one step at a time. As a 28-foot diesel powered motor home isn't exactly eco- friendly in and of itself, we took it upon ourselves to use it as a showcase of the many sustainable alternatives available today to not only make a lighter footprint in an RV, but that people could also take into their own lives and homes. Thus began a 10-month journey to put as many e-friendly alternatives on top and inside, and find as many fuel alternatives available around the continent to run our home for the year. We certainly are not saying it is perfect by any means, only that we did as many things as possible given our timeline, knowledge, and budget, and we are still on the lookout for a few key items to go even greener. Moreover, we would like the tour's home to be seen as an "environmentally evolving RV", hence why we call her our "E-volution RV". Sponsored by Carmanah Solar Technologies. By using the power of the sun, Carmanah's Go Power Solar Kit provides enough power to run our appliances, computers, and almost completely reduces our need to plug into the grid. Where possible, the tour has used non-food based tallow biodiesel, 2nd generation biomass, and other non-food base bio fuel. When this fuel is not available, we are fuelling on straight, ultra low sulfur diesel. At the completion of our tour, we will add up our carbon emissions we were not able to reduce, and have them offset by the carbon offsetting company, EcoNeutral, in Vancouver, BC. Our tour shirts consist of natural, sustainable, and recycled fibers, use less water, agricultural land, pesticides and natural resources, have no chemical treatments that can be absorbed through the skin, are non-toxic, hypoallergenic, and are healthy for your body. Low-flow water devices installed in kitchen sink, and shower head. This reduces water consumption by reducing the flow rate. We also practice conservation by turning the water off when washing dishes, stop the flow after initial rinse when showering and washing hands. The RV has a 60 liter tank which 3 people go through every 2 - 3 days. As much as possible, we are only consuming 100% organic food, drink, and supplements. Our coffee is traded fairly and directly with small-scale producers in developing countries. Much of our organic materials are broken down by earthworms in our compost (also called a "vermicompost"). 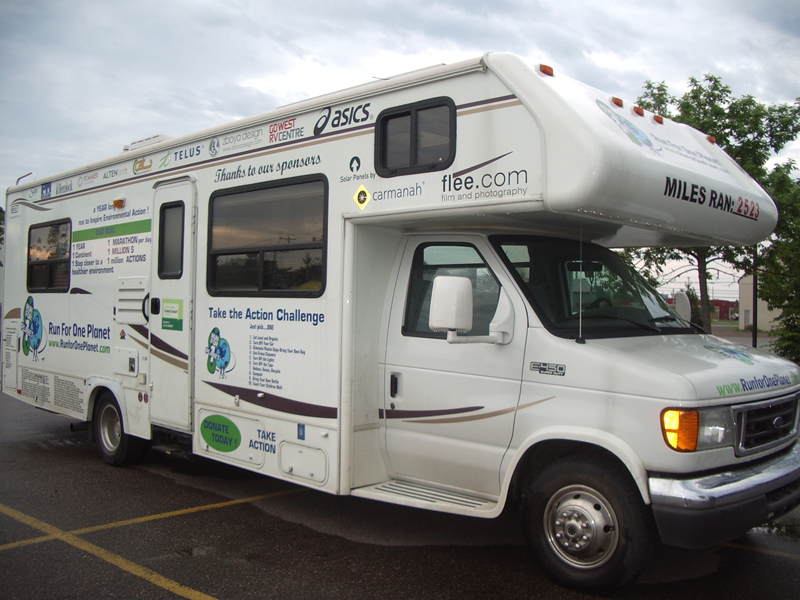 Should you wish to contribute to the RV's environmental evolution, please contact Matt Hill at Matt@RunForOnePlanet.com. Thank you very much!